Provided by the Android version 4.0 Ice Cream Sandwich, the new update the Twitter app offers a streamlined interface style "Holo UI." On the other hand, regardless of OS functionality Cards has also been improved. 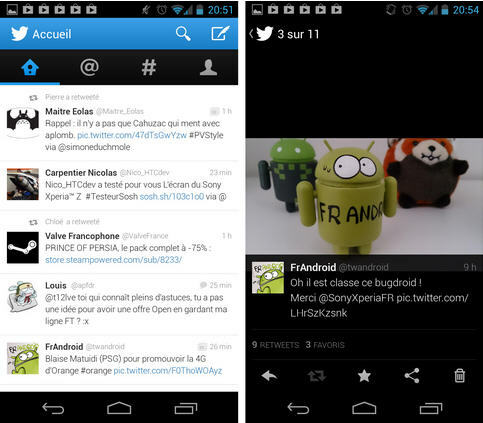 This is an "exclusive" Android: updating the Twitter application provides an interface Holo UI style, but only under the Android operating system, not iOS. The aesthetic is more refined and gives a fresh network of microblogging. The interface is more fluid, faster. The application offers including navigation between the different sections of Twitter (Home Interaction, Discover ...) with just a flick ("swipe"), greater ease for "tagg" users and insert hashtags in tweets (improved auto suggestion). The update has also improved the functionality Cards, to embed content in a tweet, whatever the operating system. Now, new formats can be "embedded" links to other apps, image galleries, product information ... 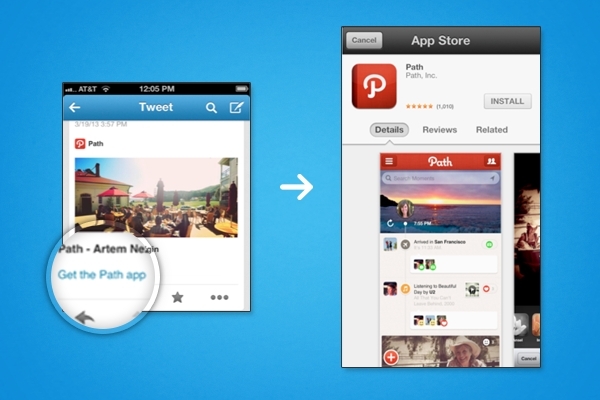 If, for example, a tweet has shared content from another application (Flickr, Angry Bird Path , Foursquare, etc. Vine. ), a link to the application is available by clicking on "Get the ... App." A link to the download center as Google Play or App Store can also be presented.